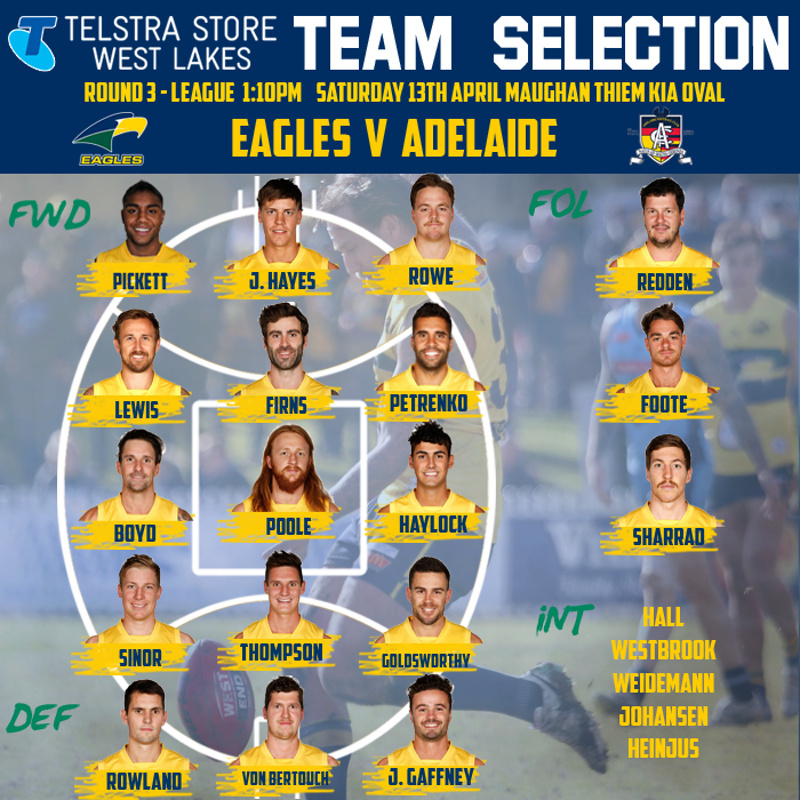 And interested whose going off to the AFL for Adelaide. Forget what your interested in for a sec, who would you send back to the reserves & why ? Good question let’s think firstly West hasn’t performed in the ruck . 4 Hayes is a test not sure if he is back . Do the eagles let Pickett have a second game ? That leaves the interesting conundrum Westbrook was brought in last week . Does he keep his spot . If Hienjus is an in does that mean Westbrook goes out . I’ve raised more questions answering yours Bayman or trying to answer it . Oh the Eagles need big Seb back from suspension . And if Pickett is dropped does Mead come in ? Johansen goes out and keep Pickett in. Wasting their time with Jake.....is not a team player and is not up to it. With Godden gone, watch what happens with him and how he react if he gets dropped. Super Gonz wrote: Johansen goes out and keep Pickett in. Wasting their time with Jake.....is not a team player and is not up to it. With Godden gone, watch what happens with him and how he react if he gets dropped. Hall won't be there this week, so that makes it easy for one spot. von Bertouch must be up forward - can't have Jack Hayes being teamed 2-3 to 1 all the time. Depends on who is coach we saw Rowe in 2018 given a game then out then in . Goddens ( and I was a big fan of gods) favourite player hasn’t made the league so far this year . But after me saying that some older players like Lewis are playing better . spell_check wrote: Hall won't be there this week, so that makes it easy for one spot. von Bertouch must be up forward - can't have Jack Hayes being teamed 2-3 to 1 all the time. Before I forget ( my memory issues ) I saw Pickett’s entire game against North’s seconds. Match being broadcast on both SEN 1629 and Digital Pass. Big in for Adelaide with Bryce Gibbs. I’ll go the other way firstly YOU could do that I haven’t seen an Adelaide team . Or next game I won’t put any team up and let talking footys admin do it . It’s not my responsibility to post teams . And seeing you say it’s disrespectful after this weeks game I will no longer post teams on this forum . To end me being disrespectful of other teams and posters who may wish to place a bet . nothing...but BOTH TEAMS should be posted, or do you play with yourselves ? Thiele is admin I think as you stated before you asked admin to do it . Again I ask why do I need to post the other sides team for you . Surely you can go onto the sanfl app and actually look . Once again it’s not my job to give two teams to a person who what gambles on the games . Doesn’t bother me if you do or don’t but saying I’m disrespectful to Adelaide is a joke .